ABBAS AMANAT received his B.A. from Tehran University in 1971 and D.Phil. from Oxford University in 1981. His principal publications include Pivot of the Universe: Nasir al-Din Shah and the Iranian Monarchy, 1831-1896 (1997) and Resurrection and Renewal: the Making of the Babi Movement in Iran, 1844-1850 (1989). He is the editor of Cities and Trade: Consul Abbott on the Economy and Society of Iran (1983), Crowning Anguish: Memoirs of a Persian Princess from the Harem to Modernity (1995) and co editor of Imagining the End: Visions of Apocalypse from Ancient Middle East to Modern America (2002). 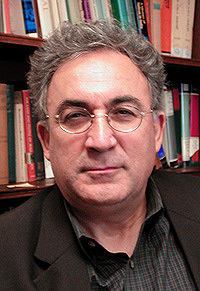 He also edited The United States and the Middle East: Diplomatic and Economic Relations in Historical Perspective (2000) and co-edited The United States and the Middle East: Cultural Encounters (2002) and Apocalypse and Violence (2004). He is the editor of Mage’s Persia Observed Series, which includes Edward Browne’s The Persian Revolution of 1905-1909. Abbas Amanat is a professor of history at Yale University.